The essence of fine furniture redefined. Here is your opportunity to own our collections of clearance floor samples of furniture and accessories at drastically REDUCED prices. They feature the same balance of remarkable designs and quality materials but at significantly reduced prices. These clearance floor samples are sold as is and the sales are final! Quantities are limited. Once they are gone… they are gone, so hurry! Scroll down to see all the clearance floor samples. 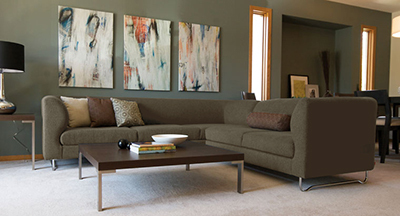 The Simpson sofa exudes retro inspired lines and is perfect for smaller spaces. It’s upholstered in sumptuous Classic Sahara two-tone leather and can integrate so well with other patterns thus acting as a counterpoint that brings modernism to a room. Do you want to satisfy your modern design passion but still stay under budget? If so, then the Stella sofa is an excellent option and not only because of its affordability. With its simple, modern design and chrome legs you can easily spruce up your living room. It’s an ideal sofa for those with smaller spaces. It’s upholstered in Key Largo Teal fabric which is rich in color and features a woven textured appearance. The Replay sectional features a sculptural form that can brighten any space in need of modern style. Upholstered in Polo fabric that features a wonderful woven texture and a smooth hand. The unique tubular design legs offer that final touch. The Byrd sofa offers a clean Mid-Century modern look with its bench seating, button tufting on the seat backs, and long slender legs. It’s a timeless design that is as stylish as it is comfortable. The beautiful design is further enhanced with Urban Ivory microfiber fabric. Complete your Mid-Century modern living room collection with the Byrd loveseat. With the same design features as the sofa and the same Urban Ivory fabric, this collection is a welcomed addition to any modern living room environment. Finalize your modern Byrd collection with the Byrd ottoman. The Urban Ivory microfiber upholstery surrounds the modern design of the ottoman creating a stylish accent piece that fits comfortable in any decor. Have you just created a home theater area in your very own home and are in need of theater seating? This Shields is an ideal solution. 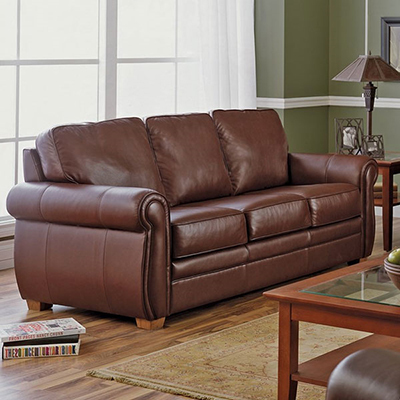 The deep brown color of the Roma Bistro leather upholstery surrounds this sectional creating a stylish piece that fits comfortably into any decor. 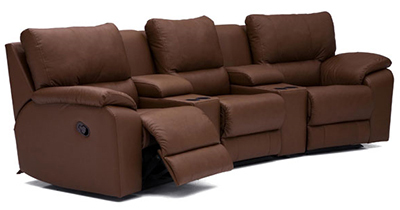 The recliner on the left hand side is powered while the other two recliners are manually operated. Convenient storage areas and cup holders are located in the wedges where you can place various items and your favorite beverages. The Viceroy sofa get an energetic transitional surge from Oxford Sorrell leather upholstery, welt cord trim, tapered legs, creating a stylish look. It’s a sofa that says it all in one piece. Create the living room of your dreams with the unique transitional design of the Viceroy upholstery collection. 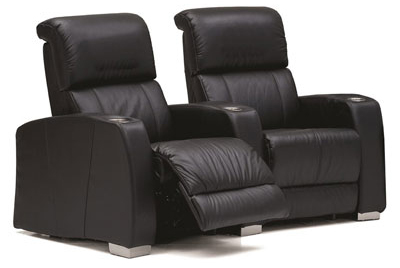 See, hear, feel the difference of an ultimate home theater that this Sequelle 2 seat curved home theater seating from Palliser offers with power on one recliner and manual on the other one. It features black leather upholstery, chrome cup-holders, and chrome legs. The ergonomic design provides utmost comfort with lumbar support. Weight capacity for each recliner is 250 lbs. 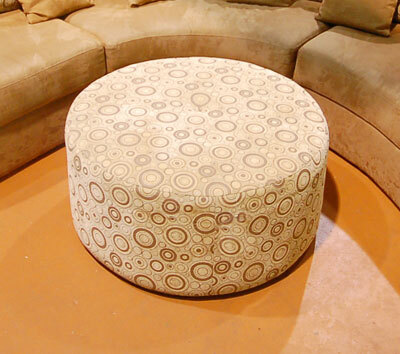 Even though it was part of a sectional group, this round ottoman can be used as an accent piece in any room. In a room full of rectangles this round ottoman has a fresh look and a nice balancing effect. The Dizzy Sandstone fabric pattern is stylish and can mix well with other solids, making it easy to instantly refresh the look of a room. Whether you use it as a an ottoman to plop your legs on it or as additional seating, it can easily become a comfortable, relaxed favorite. Adjustable glass shelves in a variety of sizes, 4 bottom drawers, and a dark wenge finish define the unparalleled contemporary elegance of the Astro entertainment center. 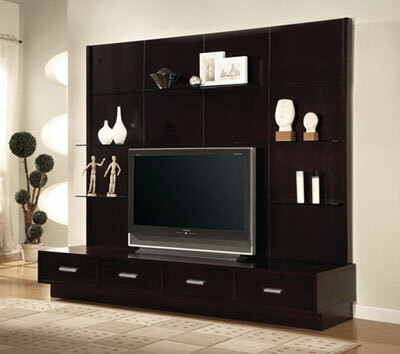 With this entertainment center you can adjust the glass shelves exactly to your taste. 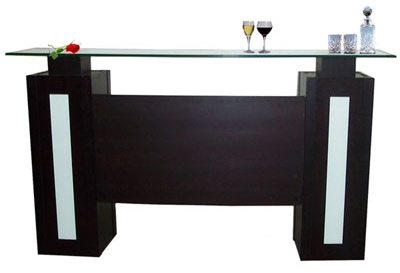 Home bars are essential for entertaining guests at home and the Elise bar counter is great choice. If features 2 fixed shelves in each of piers, 2 fixed shelves and 1 fixed glass shelf in the center so you can easily store your glassware and liquor bottles. The wenge finish adds that perfect contemporary touch. Grace your living room space with the Elise rectangular cocktail table and square end table which feature sand-blasted glass inserts and a wenge finish. The large, well-proportioned legs provide an appeal worthy of the more contemporary homes. The hardware for attaching the legs to the tops is cleverly concealed for that clean, look. Make these occasional tabled the focal point of your living room today! Includes a rectangular cocktail table and a square end table. 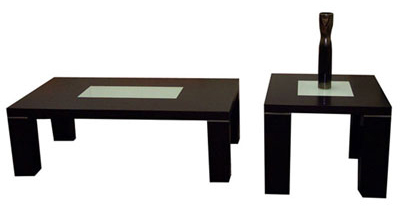 This rectangular dining table features straight lines. The natural finish of this dining room table goes to show that contemporary design doesn’t have to be cold. The neutral, natural finish of this table can also establish a relationship with just about any other color. Lime, red, or aqua chairs, for example, will really pop when displayed against any amount of natural. The chairs are not included. 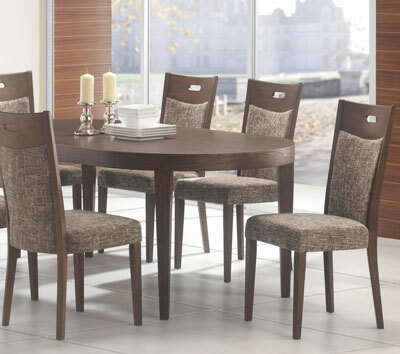 When it comes to bringing character and Mid-Century modern style into your home decor, the Pierce dinning set with the oval dining table is sure to do the trick with its beautiful rich walnut finish and ash veneered top. The chairs feature a multicolored fabric seat and back cushion. The set includes table and 4 side chairs. 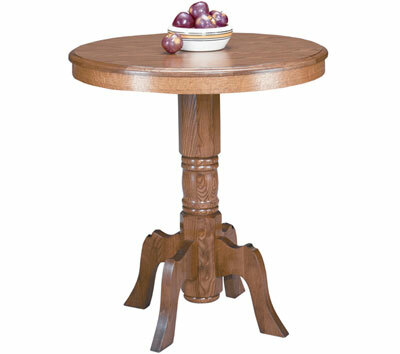 Classic style and ultimate convenience make this pub table a great addition to any bar area. Laminate top is a good choice for busy households. The high-pressure laminate top of this pub table offers enough room for serving food or drinks and it resists scuffs, alcohol, boiling water, cosmetics, moderate heat, and stains. 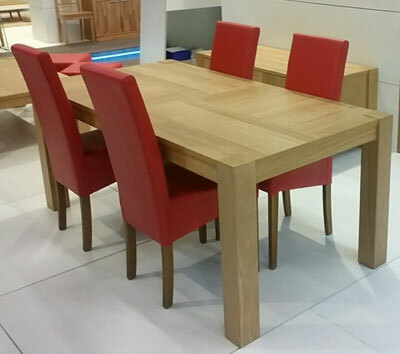 The legs and base are constructed from solid European Alpine Beech wood finished in oak. The wood details reveal its excellent craftsmanship. It features solid European alpine beech wood base and legs. The parts are dipped, rather than sprayed, yielding a thicker, more evenly applied oak finish. 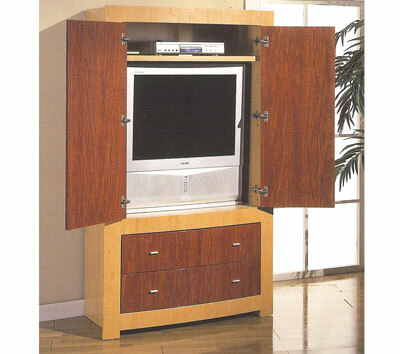 The high-gloss, two-tone cherry and maple finish coats the relaxed contemporary design of the Hilton armoire. With the flared sides design, this armoire will transform the atmosphere of any bedroom. It is adaptable for a TV or clothes. If features, 2 doors, 2 drawers, 1 clothes rack, and 1 shelf. The curved front design adds to the overall uniqueness. The doors and drawers are adorned with silver drawer pulls. The back panel is fully finished. The drawer glides are side mounted for easy drawer operation. Every home bar deserves the comfortable seating whether it’s for family or friends. 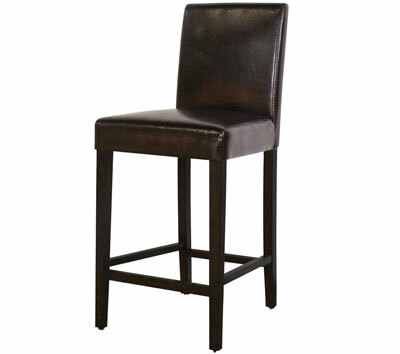 This Bistro bar stool features hardwood construction in a wenge finish. The seat and seat back are clad in dark brown leather. Add this bar to your home and your existing home furnishings without giving up comfort and style. Only 1 left! The Princess twin bed was proudly made by Elliott’s Designs. 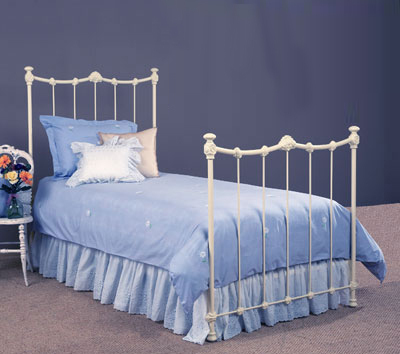 This antique replica iron bed is of higher quality than the original. It features the finest quality powdered polyester, chip resistant epoxy paint in white. The paint is applied electrostatically and baked to ensure a long lasting lustrous finish. Made in USA. 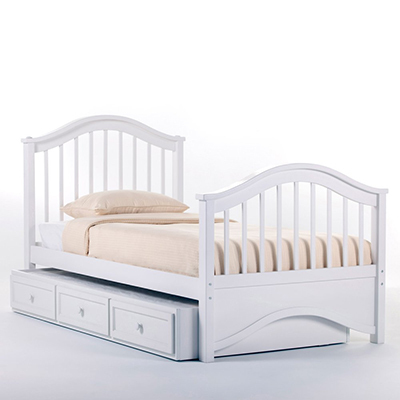 The Classic twin bed in white finish features an arch style headboard and footboard. Because of its slat-support system, a box spring is not required. Shown is an optional under-bed trundle in which a mattress can be placed for an additional sleeping space or when not in use it can be a great area for storage. 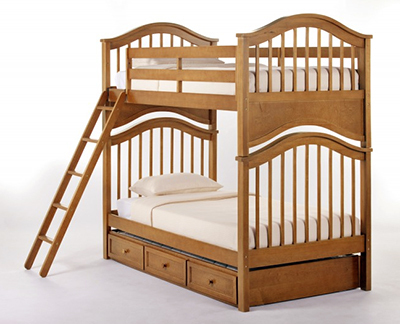 Just like the twin bed, the Classic bunk bed features the same arch style design. 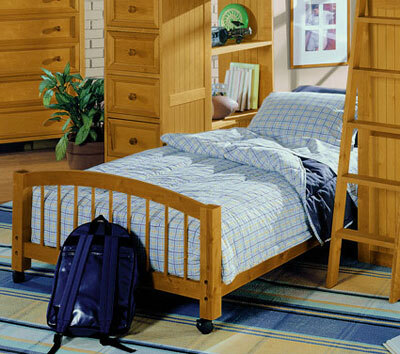 The rich pecan finish makes it a great addition to children’s bedrooms. This bunk bed can be separated into 2 twin beds. 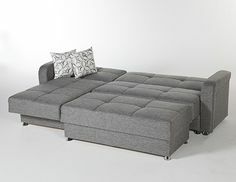 Just like the twin bed, it can be purchased with an optional sleep/storage under-bed trundle. This twin bed is nothing like your grandparent’s cottage bed. This Cottage bed features a swayed headboard and footboard design but with a modern twist and is adorned a rich, chocolate finish. There is no need for a box spring since it includes a slat-support system. The under-bed storage drawers shown are optional.. This lower bed was part of the multifunctional student loft system which simply slides under the loft. 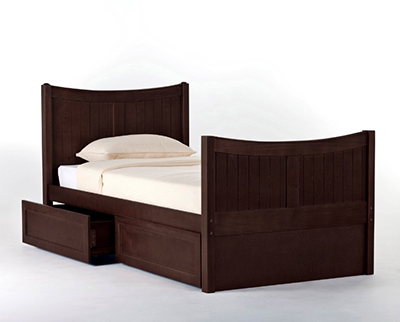 Constructed from birch hardwood and featuring a slat support system, which eliminates the need for a box spring, this bed is a great choice for those looking for a low-to-the-ground bed. The rich pecan finish naturally acts as a dark field to offset the lighter tones in your child’s bedroom. It features casters with locks for easy mobility. This beautifully styled low bed with arched headboard and footboard can be a great addition to any kid’s bedroom. Part of the student loft system, this lower bed in white finish is constructed from birch hardwood. It features slat supports which eliminate the need for box springs. Simply add a mattress and your child is all set. Casters with locks are attached on the bottom of bed posts. The Canyon Lake desk and hutch are constructed from birch hardwood and feature a rich cocoa finish. The styling is classic Mission. The desk has a surface that is large enough to place a PCs or a laptop. There is a drawer on each side of the desk while in the middle there is a drop-down drawer front, slide-out keyboard tray. The desk hutch features a cord-cutout and 1 adjustable shelf. Price includes desk and desk hutch. 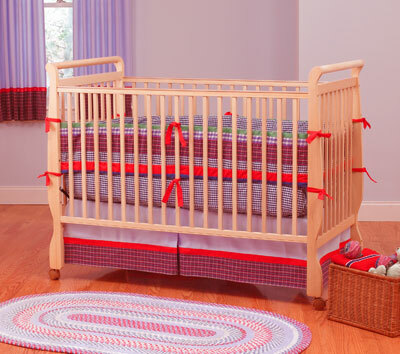 The simple, clean design elements of the Basics simple crib give it a classic appeal. The casters on the bottom allow for easy mobility. The solid birch construction will last the test of time. The natural finish brings out the beauty of birch hardwood. The multi-step finishing process produces a durable, safe, non-toxic coating, which creates a beautiful finish. This entry was posted on Tuesday, October 10th, 2017 at 9:09 pm	and is filed under Sales Events. You can follow any responses to this entry through the RSS 2.0 feed. Both comments and pings are currently closed. FOW is a fine furniture store located in Lyndhust, New Jersey. We are literally minutes from New York City. Unlike typical furniture stores FOW offers a stylish, sophisticated interpretation on home furnishings. Visit us in person or shop online.